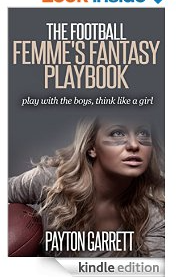 Our very own Payton Garrett has just released her first ebook, “The Football Femme’s Fantasy Football Playbook“. In a little under a year, Payton has went from creating her first blog about fantasy football to writing an ebook and contributing to several sites. She has a very bright future and is truly a rising star. You can connect with Payton on Twitter at @DraftDayDame, on Facebook or follow her personal blog.